In this post we will be discussing about using form data to upload file to a spring boot based REST server with angular js as client.We will have a sample project having a form to upload a file and once the file is uploaded, we will be displaying the same in a table with a download button and whenever this button is clicked the image will be downloaded in the browser. We will be using spring boot to ease our development. So let us get started with file upload with angular js and spring boot. Following is the project structure which we will be creating. Following is the final output of what we will be implementing here. spring-boot-starter-parent: It provides useful Maven defaults. It also provides a dependency-management section so that you can omit version tags for existing dependencies. 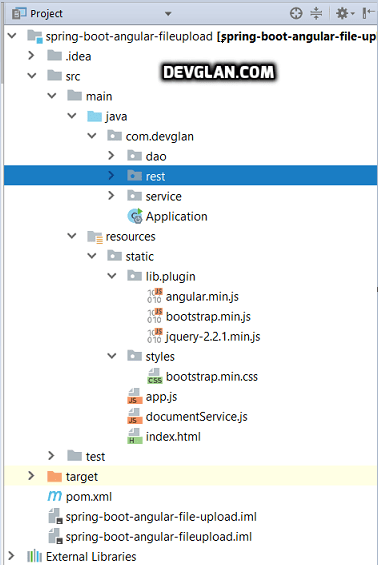 spring-boot-starter-web: It includes all the dependencies required to create a web app. This will avoid lining up different spring common project versions. spring-boot-starter-tomcat: It enable an embedded Apache Tomcat 7 instance, by default.This can be also marked as provided if you wish to deploy the war to any other standalone tomcat. spring-boot-starter-data-jpa: It provides key dependencies for Hibernate, Spring Data JPA and Spring ORM. This class has rest endpoints exposed for file upload.It has also some endpoints exposed to download the document. Rest of the server implementation are common codes which can be found in the source code below. Now let us move to client side. We have a simple .html file having a input type as file and a bootstrap table to display the uploaded file. It can be found in the source code. Let us take a look into our angular controller implementation. The controller implementation is a very simple. We have one directive defined as fileModel that is responsible to set the uploaded file in a $scope variable. Rest of the implementation is very common. It has methods defined that is responsible for calling angular service methods which makes REST call to upload the document and read the document. And finally, following is our html page where we have used the file-model directive.